A Cornish town famed for its association with the legend of King Arthur is celebrating after completion of a £3m facelift. Tintagel has seen artists working alongside builders and children to improve every aspect of the town. Phrases in Cornish and local dialect have been carved in Delabole slate and form a wall of words in Trevena Square. New oak seating has been built to allow more outside events in the town centre like concerts and carnivals. 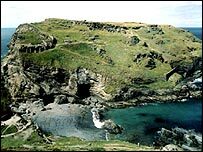 Tintagel's connections to the legend of King Arthur attracts thousands of tourists each year, an estimated 27,000 visitors come each year spending about £5.5m on products and services. English Heritage says the aim of the project is to make the town more attractive for tourists and local people alike. Other works include the rebuilding of beach steps down to Merlin's Cave and new landing platforms at the castle so visitors can stop to rest and admire the scenery. Electricity cables and telegraph poles have also been removed to enhance Fore Street. The wall of words will be unveiled with a procession of banners on Saturday afternoon.